4 Images 1 Mot is an Android app developed by LOTUM GmbH (Kurstrasse 2 61231 Bad Nauheim Germany). 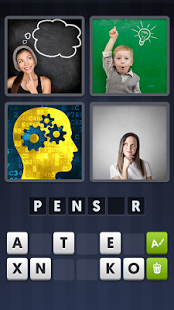 Others apps created by LOTUM GmbH are: 4 Bilder 1 Wort, 4 Pics 1 Word, 4 Pics 1 Word. 4 Images 1 Mot first became available on 08 Feb 2013. 4 Images 1 Mot has been awarded with the "Top Developer" badge. It is estimated that 4 Images 1 Mot has been downloaded between 10000000 and 50000000 times from the Play Store.